so i just got here and im looking for some friends. idk if i'll like this or how active I'll be but yeah! I like dan and phil so if you wanna chat then im here. Hi there! Glad you could find IDB! 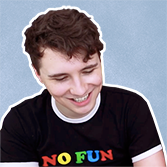 We're pretty active here, but if you really want to join active conversations check out our main thread, (currently named) Dan & Phil Part 75: @philsthiccbooty its any easy way to join in, whether you want to post or just read. Hello and ! As sonicgreen said, you can join the bants on the main thread, or find a side thread to your liking. Don't be shy! (I think im doing this right) but haha thanks for replying! Thank you so much! I'll go join it right now.